In every ending, there is a beginning. In every beginning, an end. As my time at St. Hilda’s House draws to a close, I am especially mindful of the liminal space I occupy before the doors to Yale Divinity School reopen for me in the fall, and the doors of the little pink house on Broadway close behind me. While I could easily mourn much of what I am leaving behind – the place where an assembly of strangers became family, the rhythm of daily prayer and the catholic cycle of feasts and fasts, the rooms that echoed with both bitter tears and mirthful laughter – I am more mindful than ever of what it is that I am carrying with me from this place. I arrived at St. Hilda’s in an unorthodox fashion, marred with loss. August was a tumultuous time in my life that included the painful estrangement from my beloved husband, making an impossible decision to decline admission to Yale Divinity School after moving here from North Carolina, and ultimately the loss of postulancy after a long ordination process and an entire life motivated by a persistent sense of call to the priesthood. 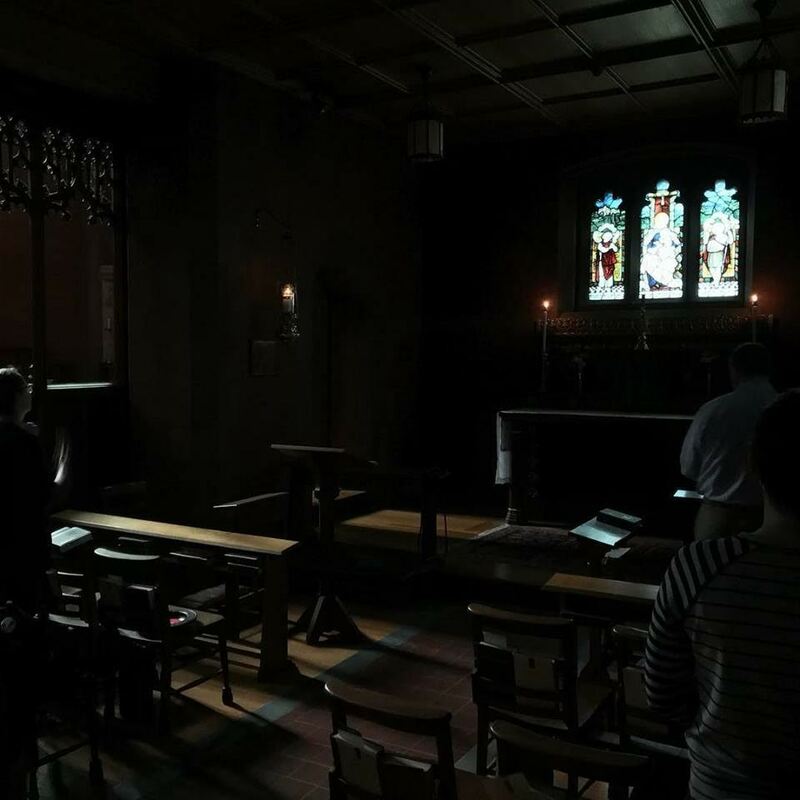 As far as I was concerned at the time, I came to St. Hilda’s reluctantly – I came to St. Hilda’s nursing the wounds of loss – I came to St. Hilda’s empty handed. But, if the Resurrection means anything at all, the end of one story is always the beginning of another. I am leaving St. Hilda’s full, nourished, and fulfilled. In community with the most amazing people one could hope to meet, everything I thought was important about myself was tested and tried in the crucible of daily prayer and work – so that only gold remained in fire, separated by grace from the dross. I have lost certainties and identities, and in their place gained faith and authenticity. Much unlike Charles Ryder, who in my favorite novel laments that, “If you asked me now who I am, the only answer I could give with any certainty would be my name,” who exclaims that he “can no longer say whether these emotions are my own, or stolen from those I once so desperately wished to be,” – I have, in this place, met myself in God. It is ponderous that I see God so much more clearly in retrospect. God was in this place, and for so long I did not know it. I see that, though much difficulty, I have been “selving” into whom God is calling me to become. In this place, I have made friends I hope never to lose. In this place, I have known grace. I have seen it on the smiling faces of the homeless with whom I shared my last cigarette; I have experienced it working with aspiring youth advocates and young adult leaders at Junta for Progressive Action. I have borne witness to the resurrection and the power of forgiveness in confessing the reconciliation my husband and I prayed for and fought to achieve this year. In a few weeks I will join my husband in our new apartment. In a few months, I will begin seminary at Yale Divinity School. Further along, I do not know where the road leads. But I am confident that the good work God has begun here, in me and in so many others, will bear fruit in both time and in eternity. The seed that has been planted at St. Hilda’s will continue to grow throughout my life. When I consider my vocation and what may or may not be, I have learned contentment in seeing through a glass, darkly. God has created me to do Him some definite service. He has committed some work to me which He has not committed to another. I have my mission. I may never know it in this life, but I shall be told it in the next. If I am in sickness, my sickness may serve Him, in perplexity, my perplexity may serve Him. If I am in sorrow, my sorrow may serve Him. He does nothing in vain. He knows what He is about. He may take away my friends. He may throw me among strangers. He may make me feel desolate, make my spirits sink, hide my future from me. If you want to be a part of Charlie's story and join in the transformational work of Saint Hilda's House, please click here to give.